The big take-away is this: you’re not creating a slide presentation, you’re creating a compelling story. Think about your audience, study the great story tellers, and use your natural empathy to connect with people. Knowing this doesn’t save you. People who understand the above take-away still make bad slides. One veteran public speaker has a few ideas why. Two weeks attempting to hack out an effective presentation has led me to think that people don’t create compelling stories because: it’s damn difficult. In the beginning I did a lot of thinking, brainstorming, walking, and talking to myself. I came up with anecdotes, metaphors, jokes, and contrasts. I thought about the Big Picture. I thought about why people would care. 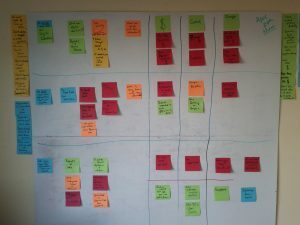 As ideas came to me, I jotted them down on sticky notes and slapped them up on the whiteboard. Periodically, I thought about structure and rearranged the stickies. Then I’d get away from it: take the dog for a walk, cook something tasty, meditate. Over time a clear flow began to develop. I had a lot to say, but I discovered an organization that made it seem like less to remember. It was a grid: for each of three rows I had three columns. The columns were the main ideas (Profit, Control, Insight), the rows were the contrasts (Past, Present, Future1, Future2). I was excited that it was coming together so nicely. And (AND!) I discovered that the 3D presentation tools of Impress.js provided a really nifty way to navigate the grid, one that would make it easy for people to follow… hopefully. Having settled on a presentation strategy, I started building the Impress.js. I won’t go into great detail about how to build an Impress.js presentation because they do such a good job of it in the html source of the demo you can download. If you are at all comfortable with HTML and CSS, you should be good. The order of the div elements in your html determine the order of the slides. Hitting the right arrow advances the slides. Since all these slides occupy the same space that the viewport is gliding, rotating, and zooming throughout, sometimes you’ll see another slide from the one you’re currently on. If this adds meaning to the presentation, keep it. More likely you’ll find this overlap distracting and unnecessary. Voila! The previous slide fades out as the next one fades in. As of this posting, impress.js still doesn’t work on an iPad. Deadlines are great for getting things done. The day before I had to give this presentation to my mentor it began to dawn on me that, even though my presentation had a lot of the right ingredients (logical symmetry, contrasts, humor, stories, metaphors), it was just way too long and it didn’t flow like a good story should. But I stuck with the plan, filled in the remaining gaps, and went to go pitch it. It’s just the presentation (no audio), so it’ll be vague at best. I plan to make improvements then do a screen capture with audio. Stay tuned. As cool as Impress.js is, it’s not going to make or break your presentation. Unless you have a really cool 3D idea, or just love HTML and CSS, you’re probably better off using something lame like PowerPoint or Keynote. Simplify means eliminate. I need to go back and chop stuff out, trim it down to a more digestible/memorable size. Stories aren’t grids. Content and delivery are audience specific. My mentor thought it was a good vision speech, but he was expecting a VC-style pitch deck. I ended up spending more time describing business and technical specifics on the whiteboard after the presentation. Plus some jokes fell flat like diarrhea on pavement. Where’s the beef? Shocker stats: get ’em, use ’em, blow peoples’ minds. Social Media Revolution videos have been so popular that they’ve remade it each year since 2009. Why? Shocker stats. Damn, I feel like there were more lessons… guess I haven’t learned them yet. Thanks for your post, help me to solve problem with hidden slides. Great !